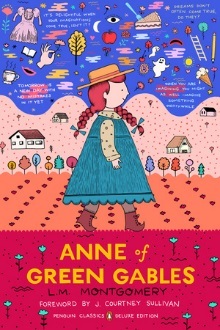 Earlier this year, I ‘listened’ to the audiobook Anne of Green Gables and found myself feeling rather sad because I felt like I maybe I had outgrown Anne. But then again, it could have been the narrator. The narrator was rather over the top. In Nov, Penguin released a new deluxe edition of this timeless children’s classic and I was eager to actually READ the book rather than listen and in my head Anne is far from whiney they was she was on the narration. I will have a review up for this one in Dec, but until then if you are looking for a holiday gift for a child…..they don’t need more toys or more electronics. That little girls you are shopping for needs a sassy redhead. She may not know it yet but she does. Anne Shirley is an unforgettable girl and the novel will become an old friend. Let’s take a look at the Penguin edition shall we? For more than a century now, Anne has been a literary icon—clever, scrappy, and imaginative, a heroine for the ages whose journey continues to capture the hearts of readers everywhere. This fall, Penguin Classics is excited to publish a brand new deluxe edition of ANNE OF GREEN GABLES (On Sale November 14, 2017), featuring a foreword by the New York Times bestselling author J. Courtney Sullivan (Maine, Commencement, The Engagements) and an introduction by L.M. Montgomery scholar Benjamin Lefebvre. This new publication also features reviews and a selection of early writing by Montgomery about the process of creating the book, along with stunning cover art by Siobhán Gallagher, whose artwork has been featured in US Weekly, Lenny Letter, Bustle, and more. Mark Twain once described Anne as “the dearest and most lovable child in fiction since the immortal Alice,” andThe New York Times calls the novel, “a Canadian cultural export matched only by hockey and the Mounties.” Since its original publication in 1908, ANNE OF GREEN GABLES has sold more than 50 million copies and has been translated into 36 languages. Anne’s tale is a celebration of fierce individualism, and the power of the families we create, rather than the ones we are born into. This cover screams raspberry cordial to me! I love how bright and cheerful it is! Any little girl would be excited to read this book just based on the cover. Adult women will love the new insights from Benjamin Lefebvre (I know I am excited to read his intro!). So if you are stumped or need a last minute gift for a little girl in your life or the adult woman in your life, you can’t go wrong with a little Anne with an E nostalgia!